When you drive through your neighborhood, how often do you really pay attention to the houses on either side of you? You may notice a particularly nice landscaping design or that one house that always seems to set their garbage out on the curb a week early, but do you go deeper than that? How often do you stop and notice a home’s garage door, for example? If you said “never,” you must not be one of the 25 MILLION people who has gotten a head start on the latest viral sensation. One enterprising young professional face painter from Cleveland, Ohio woke up one morning with a bright idea and a creative spark. What happened next went viral in a big, big way and shows no signs of slowing down anytime soon. In October of 2016, professional face painter Amanda Destro Pierson had an idea. She bought some supplies and got to work, transforming her home’s garage door from bland access point into something out of a Hollywood feature film. Her garage door now has the stunning image of a monster, complete with a fang-filled mouth on the door itself and big, scary eyes just above. What makes this such a viral sensation has less to do with the art itself and more on the entire package. As the garage door opens and closes, the monster’s “mouth” appears to do the same – transforming not just her garage door but her entire home into a spooky display just in time for Halloween. After posting a video of her Monster House in action on Facebook, the video quickly set the Internet on fire. 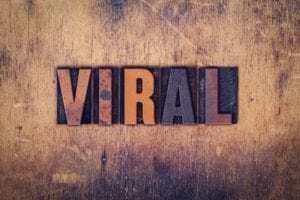 To date, it has been shared more than 25 million times and looks poised to become a sensation again and again as new viewers discover it each year. Pierson, in addition to being a professional face painter, is also a natural born entrepreneur. Sensing an opportunity when she saw one, she’s also designing Monster House kits that will be ready to purchase in the fall of 2017 so that people around the world can pull the same stunt in their own homes. If even a small fraction of the 25 million people who viewed the video buy her kits, she could have all the markings of a successful new business on her hands. Whether you’re trying to transform your garage door into a monster house of your own or you just want to make sure that it’s operating at peak efficiency, the passionate professionals at Action Garage Door Repair Specialists are here for you. In addition to selling and installing new garage doors, they also have over 30 years of experience providing extensive garage door repairs and related services to customers all over the Dallas/Fort Worth, Austin, Houston and San Antonio areas. To find out more information, please contact Action Garage Door Repair Specialists today.